In 2008 Dutch Seed Group Int. in Hem started with one HR-600 to deal with their coating production. The last few years their coating production increased which resulted in adding an extra HR-800 in 2016. But, as the production kept increasing, they recently bought an renewed HR-1000 to replace their 10 year old HR-600 coater. 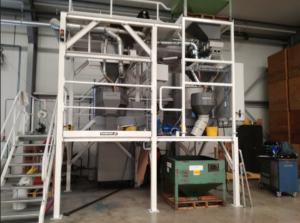 This renewed HR-1000 gives Dutch Seed Group Int. the capability to do batches of 100-120L of seeds in 1-2 minutes. One of the newest designs on these HR-1000 is the outlet shape. This new shape has been developed in cooperation with one of our customers and we are currently implementing this on all our Rotary Coating machines. The round shape of the outlet gives less damage to the seeds and ensures smooth emptying of the coating machine.